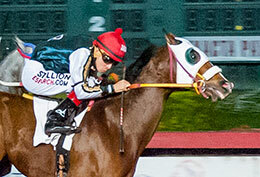 Rosenthal Ranch’s Powerful Favorite is start from the 6 post in Grade 1, $198,700 Los Alamitos Winter Derby on Saturday. LOS ALAMITOS, CA—FEBRUARY 7, 2019—Rosenthal Ranch’s Powerful Favorite and Legacy Ranch’s Mister Appolitical made a habit out of qualifying to big futurities at Los Alamitos in 2018. Trained by Chris O’Dell, Powerful Favorite won the Governor’s Cup Futurity on July 28 and also raced in the Grade 1 Los Alamitos Two Million Futurity, Grade 1 Ed Burke Million Futurity and Grade 1 Golden State Million Futurity. 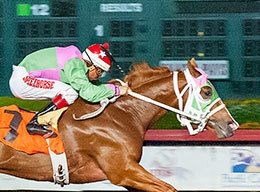 The Terry Knight-trained Mister Appolitical made the finals of the Los Alamitos Two Million and Ed Burke Million. Not surprisingly, the two classy sophomores both shined in the 400-yard trials to the Grade 1, $198,700 Los Alamitos Winter Derby on January 19. Ridden by Eduardo Nicasio, Powerful Favorite easily won his trial in wire-to-wire fashion on the way to posting the fastest qualifying time of :19.78, while Mister Appolitical also led from start to finish with Jesus Rios Ayala in the irons in route to the second fastest qualifying time of :19.79. The two impressive trial winners will now enter the Winter Derby final on Saturday night as the horses to beat. Their matchup is one to focus on in the final. The two have been drawn right next to each other in post positions five (Mister Appolitical) and six (Powerful Favorite) and what happens in their first few strides out of the gate will be telling to the final outcome of the race. When Powerful Favorite leaves the gate, he’s been pretty unbeatable. He’s been first out of the gate three times during his 10-race career and he’s raced to the winner’s circle from there. On the opposite side, Powerful Favorite has also had some tough moments in the starting gate, including several times in which he’s been hard to load and/or become fractious in the starting gate. Even when he won his Winter Derby trial by length three weeks ago, Powerful Favorite broke through the starting gate, but to his great credit, he was able to regain his composure on the way to cruising to an impressive victory. As usual, Nicasio will aboard the Favorite Cartel gelding in this stakes final. Mister Appolitical, a gelding by Apollitical Jess, has shined when he’s left on top against quality opposition. As previously mentioned, he won his derby trial while leading every step of the way. He’s posted two other victories in wire-to-wire fashion. Mister Appolitical usually minds his manners in the starting gate, but he’s bumped rivals several times at the start of some of his races. A clean journey and Ayala and Mister Appolitical will be tough customers in this derby final. Marin Jones and Steve McIntyre’s Cole Man 47 is as consistent as they come at the top level. The gelding by Stel Corona has finished in the top three in 10 of 11 career starts, his biggest win coming in the Grade 2 PCQHRA Breeders Futurity last year. He also won the John Deere California Juvenile Challenge by daylight in 2018. Cole Man 47, who finished second to Mister Appolitical in the trials, is making his Grade 1 debut in this race.